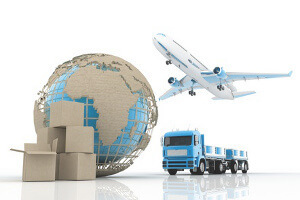 The Aboard Shipping Wizard (SW) provides shipping rates for worldwide shipments of merchandise. It provides shipping options and rates for online customers purchasing goods over the internet and sales persons entering orders. It calculates the optimal solution for packaging the items of an order to ship into boxes. A box or shipping container is a container of any type, you can define the types you use at your company, specifying their inner dimensions so the system knows how much space they provide and the three dimensions of that space. Before requesting rates the different restrictions applicable to the different shipping services are checked to discard non-viable services for the merchandise to ship. It gets rates instantly from the online services of the biggest couriers. The system currently supports UPS, FedEx and the USPS. It also polls a local table of LTL (Less than a Truck Load) transportation services used by the company shipping the merchandise. It selects the best shipping price but also provides all the shipping prices obtained, specifying the speed of delivery of each service. The first module merits some additional analysis. Calculating the optimal solution for packaging items into boxes presents a complex geometric and combinatorial problem. Some shipments contain tens or hundreds of smaller item boxes, so the combinations of how to put the items in the shipping boxes grow exponentially. The challenge is to optimize the number of boxes or to optimize the used box space. This is a problem of exponentially increasing time of calculation. Trying all the possible combinations is usually not viable for even a few tens of items. The additional challenge is that this must be done while a user waits for the shipping cost of his online purchase, or while the customer waits on the phone while the sales agent inputs the order and tells him the cost of the shipping, to ask for the customer approval. That is, all the steps above should be accomplished for most orders in an interval of two to three seconds at most. Finally, the system communicates with the software packages of the main couriers, to provide destination, weight, etc. of the shipment and to retrieve a tracking number with which the order is tagged and for which orders can be searched. The algorithm is used for optimally fitting the item boxes into the shipping boxes incorporates some heuristic criteria that provide faster arrival to optimum shipping box solutions. The algorithm even displays for the user what shipping boxes to use, and the order in which the items must be put inside the shipping boxes to make sure that they will fit. The communication with the courier online rate services allows for the shipping company to use either standard or negotiated rates. The service requirements of maximum weight, girth, length, width or height are evaluated, as well as restrictions concerning transportations of hazardous materials. The additional tables of LTL services provides an effective method of shipping for companies or specific shipments that cannot use the main couriers.